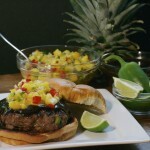 Teriyaki Burger with Pineapple Mango Salsa-What the "Forks" for Dinner? 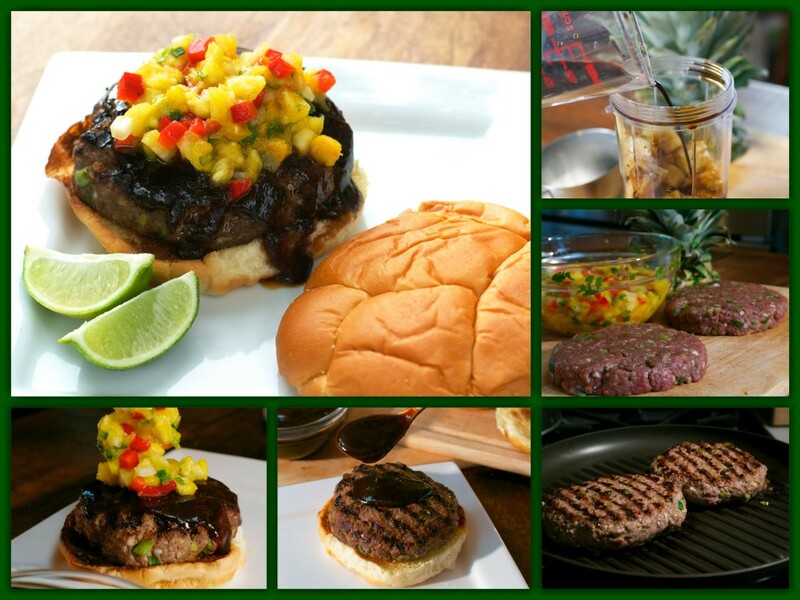 Burgers, burgers, burgers,…………Teriyaki Burger with Pineapple Mango Salsa. Now that the weather is warm, I have two things on my mind……Salads and burgers. It is all we have eaten recently. Ok, we have had the obligatory pizza……several times. We still have to get our grill up and running……….just lazy we are! But, we have a grill pan so……….sorta the same? Ok, not really, but these burgers were really great even without the aid of the outdoor grill. My conception for these really came from pineapples and mangos being on sale at the store, and they were beauties. If cutting the pineapple and mango is not your thing, you can use canned or frozen, but it really is perfect with the fresh. 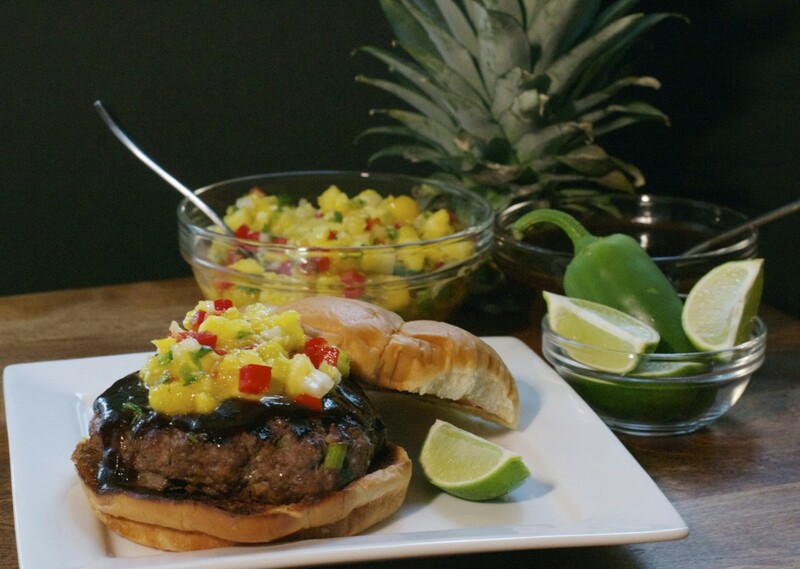 So, since I wanted to make a burger, and pineapple goes with an Asian flare, that was my direction. I added green onions, garlic, ginger, soy and a touch of red pepper flakes for heat to the beef. Now, I have made these twice, first time with ground beef, and the second time with ground chicken. Both were equally yummy, so what ever your taste is, go with that. A turn on the grill, and the burgers were done. For the salsa……the pineapple and mangos were mixed with avocado, red pepper, onion, jalapeño, cilantro and a squeeze of lime. Then mixed all together and set it aside. When I think of burgers, I always think of ketchup and mustard, but not with these and we do like something on a burger. The sauce was simple with the aid of my trusty imitation Bullet. We bought a cheap version, just to be sure, we would use it and liked it before we shelled out the cost for the real deal. Well, the cheapo has worked really well, so why spend over a hundred when you can spend twenty? I just put all the ingredients for the sauce……fresh pineapple, soy, ginger, garlic, rice wine vinegar, and a touch of sesame oil. Gave it a whirl in my handy, dandy, cheapo Bullet and I had a sauce…….well almost. I heated it to a boil and added a cornstarch mixture to thicken. Lightly toasted Kings Hawaiian Buns were perfect for this burger. The burger, the sauce, and the salsa……..oh la la…….oh wait thats French………well anyway there were a tasty, tasty burger. Combine all of the ingredients for the burgers in a medium bowl,and shape into 4 patties. 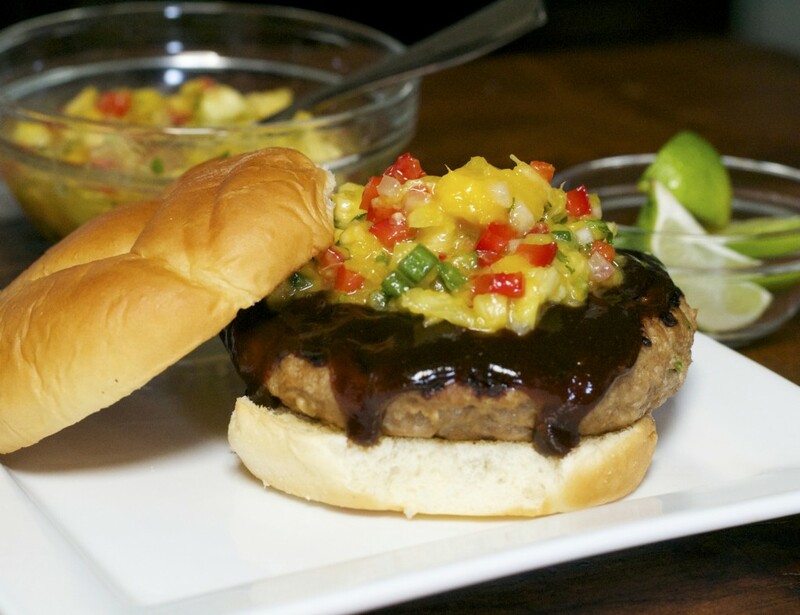 Place your patties on the grill and cook 10-15 minutes or until well done, flipping half way through. Grill buns if desired. Combine all ingredients in a medium bowl. Mix thoroughly and set aside. Place first 7 ingredients in a blender or food processor. Blend until smooth. Pour mixture into a medium saucepan. Over medium high heat, heated cook mixture until bubbly, about 1-2 minutes. Meanwhile, blend cornstarch and water until smooth. Add cornstarch mixture to saucepan. Heat stirring constantly until mixture thickens. Remove from heat and set aside. To assemble burger place each burger on grilled bun. Spoon sauce over burger and top with salsa. Serve. We like large burger so the serving size is 2. But if you like a smaller burger you can get 4.